Blood Orange stars in Gap's interactive ad. The holiday season is to the retail world what the Super Bowl is to big-name brands. Stores on both sides of the Atlantic are pushing out high profile campaigns in a bid to capture that all-important share of Q4 wallet. Looking beyond the traditional divide between digital and brick-and-mortar outlets, a handful of interactive tech integrations are driving engagement online and in the store space. These creations draw on gaming, augmented reality, shoppable videos and personalized experiences. Here’s our pick of 10 of the best. 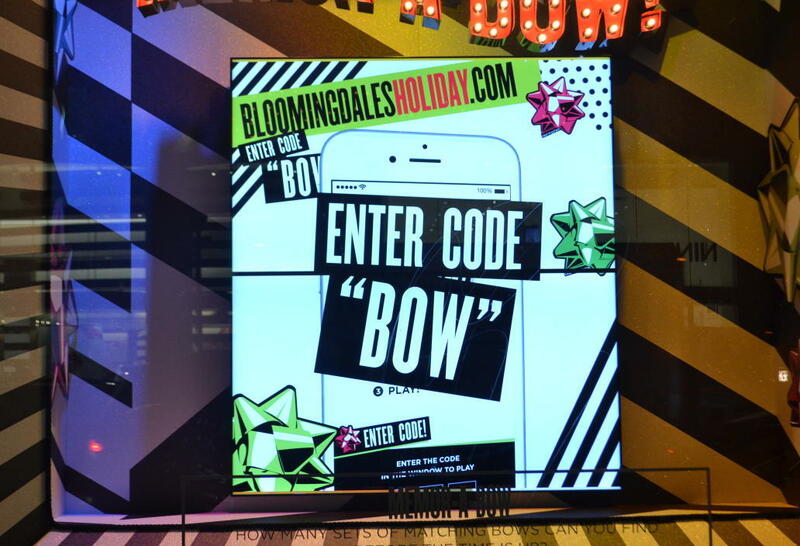 Bloomingdale's is all about interactive windows this holiday season, with a series of gaming experiences tied to the theme of bows. Shoppers are encouraged to participate by connecting to Bloomingdalesholiday.com via their smartphones. Challenges include a card-turning memory game called Memo-a-Bow; a kind of Space Invaders activity called Whack-a-Bow; and Peek-a-Bow, where users have to keep track of a bow hidden under one of several moving boxes. Created by retail innovation company The Science Project, the site also affords participants the opportunity to take selfies on an interactive touchscreen and share them over Facebook, and see tweets posted using the #bloomiesgreetings hashtag appear across the New York skyline behind the glass. The game is also afoot at Target, where a partnership with Google’s Art, Copy & Code team and creative agency 72andSunny has produced a mobile experience called Bullseye’s Playground. The six games include sledding with Target’s mascot bull terrier, Bullseye, racing in a Hot Wheels car, and enjoying snowball fights and ice fishing. In-store signage prompts shoppers to discover special codes throughout the store that unlock new characters and game levels. 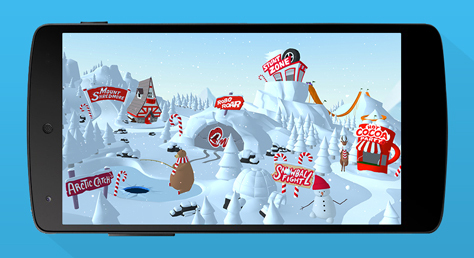 In certain stores, the interactive initiative extends to an immersive 3-D adventure; Google’s Project Tango tablets transform the aisles into a winter wonderland as the setting and characters change onscreen as the user moves. Gap might be pushing four short videos directed by Sofia Coppola as the main portion of its campaign this holiday season, but it is also playing host online to a more innovative interactive experience. An augmented-reality gift guide lets online shoppers create music from the stripes they’re wearing. 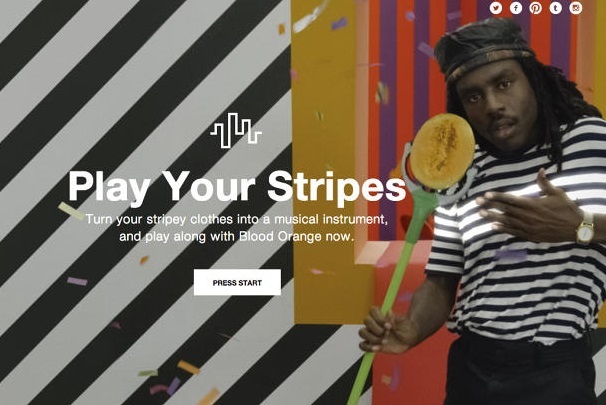 "Play your Stripes" lets users remix Blood Orange’s soundtrack "It Is What It Is" by transforming their own clothing into musical instruments. Kate Spade arguably wins the crown for most amusing holiday film this season, with a short spot called "The Waiting Game" that features Anna Kendrick locked out of her apartment. With time to kill, the actress entertains herself by talking on the phone, singing familiar holiday tunes, and sipping champagne through a straw straight from the bottle. She also tries on various pieces she’s just bought from Kate Spade while posing for her small dog. Users see plenty of pieces from the collection, then can click to buy them thanks to a shoppable tie-in from touchscreen video platform Cinematique. Viewers can tap any product in the film to save it in a gallery on the righthand side of the screen. From there, they can click on any saved item to complete a purchase. Department store John Lewis has melted hearts across the U.K. with its tale of a young boy called Sam and his pet penguin Monty, created by Adam & Eve/DDB. Accompanying the ad is a fully integrated initiative spanning relevant products for sale including books, plush penguin stuffed animals, penguin-patterned pajamas and more, as well as an interactive experience in the store. John Lewis and Samsung created these spaces, dubbed "Monty’s Den." 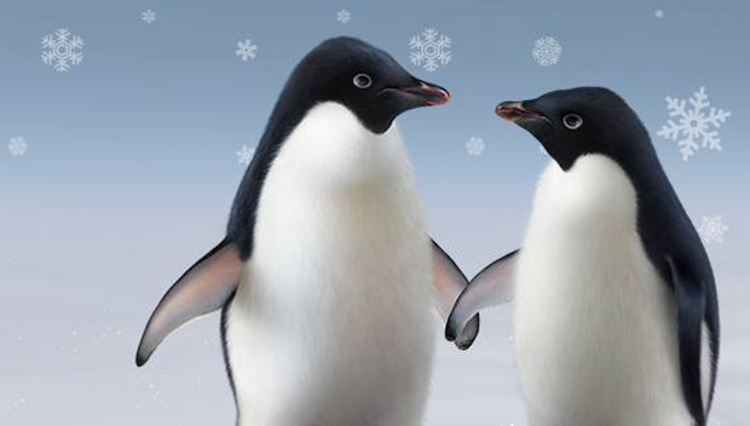 Children can take their photos with the penguin, find out more about his Antarctic friends, check out virtual-reality goggles to see a 360-degree version of Monty’s world, and explore more of the campaign’s story. In the retailer’s London flagship store, a tech-enabled experience centers on bringing toys to life through Microsoft’s 3-D photogrammetry software. Children can scan their own toys, then see it appear onscreen dancing alongside Monty. Ted Baker has introduced an Instagram-based treasure hunt conceived by Poke London that invites customers to find missing elves. An account called @TedsElfie delivers a series of clues to followers via images curated to mimic a puzzle board. Combined, the squares depict a winter wonderland; divided, each square comprises its own picture with a caption that specifies whether or not the elves are nearby. Some lead to additional accounts in a sort of "choose your own adventure" experience. Visitors who locate the elves may win other prizes, from hip flasks and bracelets to a trip to see the Northern Lights. 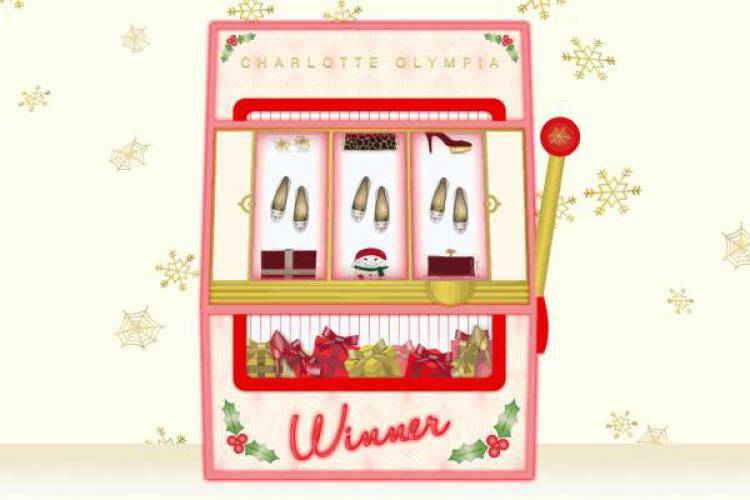 British footwear designer Charlotte Olympia has rolled out a festive slot machine on its website for the first 12 days of December. Fans are invited to spin to win iconic pieces from its seasonal collection – all they have to do it get three matching styles over the course of three tries. Charlotte Olympia has also pushed the game via social media; it shares a countdown bauble each day alongside the #spintowin hashtag. Adam & Eve/DDB is also behind Harvey Nichols’ 'Could I Be Any Clearer' campaign, which comprises a line of gift cards designed to help shoppers ensure they get what they really want this season. The cards feature six traditional Christmas designs (robins, doves, wise men and more); each one features copy wishing the reader "Season’s Greetings" or "Good Tidings" before requesting specific presents. Consumers can create their own versions of the tongue-in-cheek cards online and use a dedicated Christmas-card app to customize digital cards for every product featured on the retailer’s website. Each can then be printed, emailed or shared via social media. U.K. supermarket giant Tesco has introduced a service that browses Twitter to suggest what to buy for specific users. The Secret Scan-ta app created by We Are Social scrapes information from accounts in a bid to highlight users' precise interests based on who they follow and what they post. 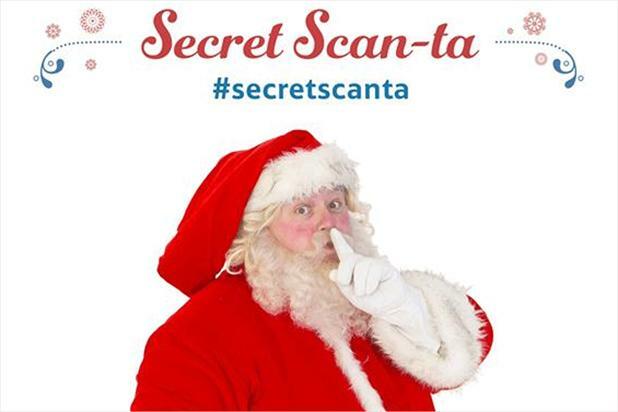 The apps showcases suggestions ranging from technology to fashion alongside animated Santa GIFs; links to the website for Tesco's loyalty card let members get double loyalty points as well as the chance to win bigger prizes. Virtual fitting room startup Metail is running a campaign that invites shoppers to see what they’d look like in a series of different Christmas-themed outfits. #Tryonxmas provides access to some of the best looks from high-street stores, as well as the likes of a Miss Santa, Christmas pudding and Minnie Mouse costume. Users enter their measurements to see how each look will work for them; when they're satisfied, they can share the results with friends. Rachel Arthur is global senior editor for WGSN.